My name is Dani. I’m a native Atlantan (ATL-ien). And one of my favorite things about this city is the food. I grew up eating what I call “low-country-soul”. It’s still my favorite cuisine to eat today. Coming in close second is Brazilian food. 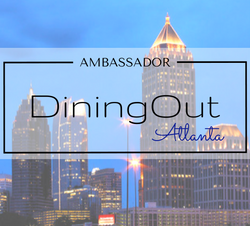 I love to cook, but I truly enjoy the experience of dining out; thus came the idea of DineWithDani. Since its inception, DineWithDani has expanded to include more of my personal interests like travel, consumer product reviews and my passion for Brazilian Samba. You can learn more about my adventures as a samba dancer here and on my social media. You can reach me at styles@dinewithdani.com with comments, questions or suggestions. If you like a post SHARE it with your social network! And please remember: the opinions expressed here are those of Dani Styles, not of any employer or brand that I may work with at present or in the future.